By Louis Jacobson on Wednesday, February 14th, 2018 at 3:25 p.m. In the proposed federal budget he released in February 2018, President Donald Trump reinforced his desire to fundamentally overhaul Medicaid, the joint federal-state health care program for the poor. While that vision has not been enacted into law yet, it appears to take a significant step away from one of his campaign promises -- a pledge not to cut Medicaid. For starters, the budget reiterates the administration's desire to repeal the Medicaid expansion enacted in some states under the Affordable Care Act, sometimes called Obamacare. Beyond that, the budget proposes converting Medicaid to a block grant approach, along the lines of a bill submitted by Republican Sens. Lindsey Graham of South Carolina, Bill Cassidy of Louisiana, Dean Heller of Nevada, and Ron Johnson of Wisconsin. "This would be major change to the program and would reduce federal spending on Medicaid over time," said Christine Eibner, senior economist specializing in health care policy at the RAND Corp. Currently, the federal government pays a share of Medicaid costs. As costs rise due to inflation, new technologies, and other factors, federal spending increases proportionately. By contrast, under a block grant approach, the federal government would pay fixed amount that would increase over time with the general inflation rate, but would not necessarily keep up with the cost of health care, which usually rises faster than other types of prices. The administration's budget document portrays this "Medicaid financing reform" as something that "would empower states to design individual, state-based solutions that prioritize Medicaid dollars for the most vulnerable and support innovations such as community engagement initiatives for able-bodied adults." The changes envisioned by the administration "would lead to savings for the federal government but would leave states holding the bag in terms of how to deal with cost growth," Eibner said. "It is likely that states would need to reduce eligibility or make other changes, such as imposing cost-sharing requirements, to make ends meet." In addition, she said, this approach would preclude states from expanding Medicaid in future years. On balance, fewer people might get coverage, according to Congressional Budget Office projections based on the original Graham-Cassidy legislation. In the meantime, a separate administration guidance -- to allow states to impose work requirements for potential Medicaid beneficiaries -- could also pose problems for the promise not to cut Medicaid. The new policy, released in January 2018, "will have the effect of cutting federal Medicaid spending in those states, because fewer people will qualify if work requirements are imposed," Eibner said. She added that it's too early to say how many -- or if any -- cuts will result, since it's up to states to determine whether to adopt work requirements, which are optional. The bottom line is that Trump's pledge to keep Medicaid protected from cuts appears unlikely to be carried out. But since the budget proposal is non-binding, and since the work-requirement policy is too new to gauge its impact, we'll keep the rating for this promise at Stalled. By Lauren Carroll on Wednesday, May 24th, 2017 at 5:43 p.m.
Trump's 2018 budget directly contradicts his campaign promise not to cut Medicaid, the government health insurance program for poor people. White House budget director Mick Mulvaney denied this characterization when introducing the budget May 23. "There are no Medicaid cuts in the terms of what ordinary human beings would refer to as a cut," he said. "We are not spending less money one year than we spent before." Yes, the White House's proposed Medicaid appropriations increase year to year. But they are increasing less than they would under current funding levels. If Congress adopts the White House's proposal, the government would spend an estimated $4.7 trillion on Medicaid over the next 10 years, compared with $5.3 trillion under current funding levels, according to the budget document. 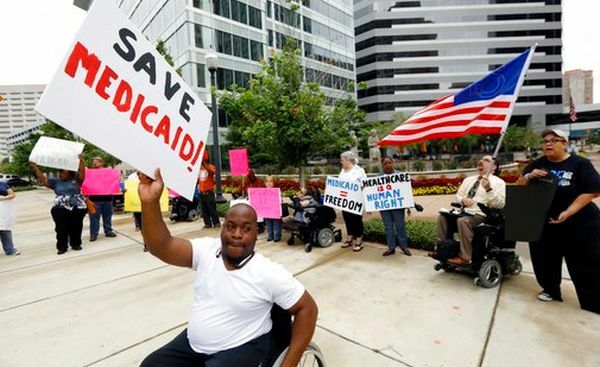 The budget calls for reforming Medicaid by allowing states to choose whether they get their funds either per capita or in the form of a block grant. The White House Office of Management and Budget estimates this would save $610 billion dollars. The budget also assumes that the House's replacement for the Affordable Care Act, which makes significant changes to Medicaid, passes. A May 24 report out of the nonpartisan Congressional Budget Office estimates that the House bill, the American Health Care Act, would reduce Medicaid-related spending by $834 billion over 10 years. According to CBO estimates, if the bill becomes law in its current form, 14 million fewer people would enroll in Medicaid over the next decade. There are are numerous obstacles standing in the way of Trump's budget proposal or the American Health Care Act in its current form becoming law. It's clear Trump has backed away from his pledge to preserve Medicaid funding, but until he signs the cuts into law, this promise stays at Stalled. By Lauren Carroll on Wednesday, March 15th, 2017 at 2:01 p.m.
On the campaign trail, President Donald Trump promised that he wouldn't make any cuts to Medicaid, the government-run health insurance program that primarily serves poor Americans. But two months into his presidency, he has endorsed a House Republican bill that would reduce federal spending on Medicaid by $880 billion over 10 years, 25 percent less than under current law, according to an analysis by the nonpartisan Congressional Budget Office. The bill is the American Health Care Act, House Republicans' leading proposal to replace the Affordable Care Act, or Obamacare. "The House bill to repeal and replace Obamacare will provide you and your fellow citizens with more choices — far more choices at lower cost," Trump said during a March 13, 2017, event to promote the bill. Trump didn't mention that some of the largest changes the bill makes have to do with Medicaid, a program that preceded Obamacare by more than 40 years. Individual states administer their own Medicaid programs, but they share the financial burden with the federal government. There are two main provisions of the House Republican proposal that affect federal spending on Medicaid. First, it scales back enhanced federal funding for 31 states that expanded Medicaid eligibility requirements, as permitted by the Affordable Care Act. If the law passes and the states don't revert to their old eligibility requirements, it could force states to pay a much larger share of the costs. The Republican proposal also places a cap on spending per Medicaid enrollee. Under current law, state governments reimburse medical providers who serve Medicaid patients, and the federal government in turn reimburses state governments for a portion of those costs. The proposal would limit the federal government's spending to a per-enrollee amount, based on the consumer price index for medical care, a way of measuring price changes among medical products and services. This might force states to decide whether to limit the services they offer or put more of their own money into Medicaid. The CBO predicts that these changes, among others, will result in 14 million fewer Medicaid enrollees — there are currently 68.6 million enrolled — which would also cause the federal government to spend less on the program. Of course, this bill is in its early stages, and there are several indicators it might not even make it past the House of Representatives. And if it does become law, the Medicaid cuts wouldn't start until 2020. But because Trump is pushing hard for Congress to pass it, we're rating his promise not to cut Medicaid Stalled.